Count discusses the math deficit in our country. Now that you have experienced what fun numbers can be there is a serious issue concerning math that I want to address. As teachers, parents and citizens of the United States, we need to become aware of a dangerous deficit in our country in the areas of math and science. As a professor of math, I was shocked to learn that American eighth grade students rank 15th in an international study on math achievement. By the time they graduate high school, they score near the bottom of all industrialized nations. All of this takes place at a time when the numbers of jobs requiring math and science is soaring four times faster than overall job growth. When you add these numbers up it equals a crisis for America’s economic future, its position as a worldwide leader in innovation and our national security. While American students are falling behind, students in countries like China and India are excelling. China will graduate four times the number of engineers as the United States, while Japan, a country with less than half our population, will graduate double the number of engineers. In just five years, it is estimated that 90 per cent of the world’s engineers and scientists will come from Asia. Good jobs aren’t being sent overseas simply because the workforce is cheaper. Many jobs are leaving because countries like China and India have employees better educated in math and science. The U. S. Department of Labor predicts that over the ten-year period ending in 2008, jobs requiring science, engineering and technical training will increase by 51 percent. Yet only five percent of U.S. college students today major in engineering, a trend that’s gone down over the past 15 years. By the end of 2008, it is predicted that some six million jobs requiring math and science skills will go unfilled simply because American youth won’t be qualified to fill them. Our national security, as well as economic prosperity, is at stake. Companies such as Raytheon- leading provider of aviation and other national security services to the Department of Defense, NASA and other government agencies– can’t outsource jobs requiring security clearances. For national security, as well as individual prosperity, isn’t it in everyone’s best interest to develop math and science skills right here at home? Now you know why Scruffy and the pals try to steer clear of me when I start talking about numbers and math. I guess I do get a little carried away. But I hope if you are as troubled as I am about what you have just read, that you will visit the site called Math Moves U. It is a wonderful place to not only read more about the math deficit, but also to find challenging and fun math quizzes for students, opportunities for grants and scholarships and information for parents on what they can do to further the interest in math for their children. Here are a few more websites I would recommend you visit that may spark a new interest in math. Fun Facts are designed for, and work best in, lower-division college courses where the typical student is not a math student. The point of Fun Facts is to generate interest, arouse curiosity and cause such students, and adults, to look at mathematics differently. You will learn about the mathematics of things like card shuffling to poker to computer vision to fractals to music, just to name a few. Or check out the many other features at Math Fun Facts. Cool Math for Kids is designed for kids ages 13 to 100 and has many fun and interesting games, puzzles and colorful ways to present numbers, like the ones that trail your cursor as you move it along the page. 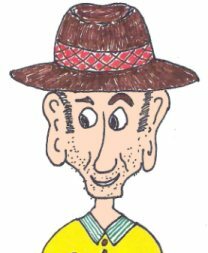 It is similar to Scruffy’s website by having interesting characters, with different interests in life, as represented by Smiley Dude, Spike, Monster, Zeebo, Stinky etc.. You’ll be glad you clicked on Cool Math 4 Kids. And what better way to change the current trend toward math than by piquing interest at an early age? Math Fun is dedicated to making math fun to learn and easy to teach for grades 1 through 9. Programs include on-grade-level math curriculums, homeschool curriculums, Montessori, and special populations needs. For a more in-depth evaluation, check out Math Fun for yourself. Well, I have overrun my alloted time again. Hope this session has enlightened you to the problems that we all face if we don't teach our children to enjoy and have fun with numbers and math. If you haven't done so, please sign up on the RSS feed below the navigation bar and you'll be notified when I have my next session. In the meantime, please let me hear your thoughts and suggestions by dropping me a note at our Contact Page. 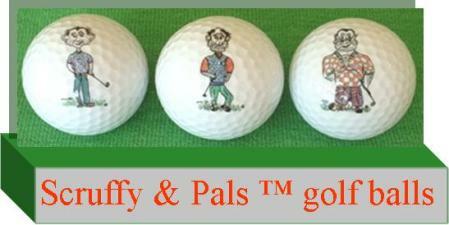 And one more thing -'count' yourself reminded to check out Scruffy's new golf balls for the favorite golfers in your life. Three balls, picturing three of the pals and nine minutes of your time add up to fifteen, which is the dollar cost of one sleeve. And that will add up to more hours of fun and enjoyment for your golf game than even I can calculate! Click on the balls below for more details.